The Japanese artist does not distinguish between the rabbit and the hare, both animals being depicted and referred to under the name of Usagi. The hare or rabbit is commonly associated with the moon in art and legend, and as in Occidental countries we speak of the “man in the moon,” so in Japan do people refer to the “hare in the moon.” The origin of this association dates back to ancient mythology. In another story, as recorded in the Mahabharata, Buddha appeared on earth as a hare in one of his transmigrations. An old, ragged, hungry traveler asked for food from the hare, the ape and the fox. The hare instructed the hungry man to gather fuel and build a fire. When the fire was burning, the hare threw himself upon it and thus sacrificed himself to assuage the other’s hunger. The beggar proved to be the god Indra in disguise. As a reward he recorded the image of the hare upon the moon as a shining example and a lasting memorial. Talent, ambition and virtue are displayed by people born in the year of the hare. They have exceedingly fine taste, and are trusted by others. They are eloquent, financially lucky, conservative, clever, and honest. Although the tiger is not native to Japan, it is one of the most popularly portrayed and highly symbolic animals in Japanese art, having been introduced into Japan by way of China through Buddhism. According to Chinese beliefs, the tiger sprang from one of the stars of the group known as the Great Bear. For this reason, it is explained, the tiger has the power to control the wind, and, because of the strength and power of its mighty roar, it is regarded by some as being an incarnation of thunder. The tiger is considered to be the king of all four-legged animals. Originally under Taoist teaching the tiger was a fearful, evil supernatural creature presiding over the west and autumn, both of which fall under the negative principle. However, under Buddhist influence the tiger assumed a positive force, its evil giving way to strength, nobility, and courage. In association with the dragon, however, it reverts back to its old Taoist negative principle. The origins of the tiger in East Asian art are very ancient. A clay tablet from the Indus valley shows a tiger and other animals in attendance around a pre-Shivaite deity. Later, Shiva, as the Lord of Beasts, wears a tiger skin. This king of wild animals was adopted by Buddhism as a symbol of power. In Central Asian temples it is found in wall paintings illustrating a popular legend of Shakyamuni sacrificing himself as food for a starving tigress and her cubs. In Chinese tradition, although its overwhelming strength is recognized, it is more a symbol of protection than an object of fear. It earliest appearance in China seems to have been as a decoration on archaic bronze vessels where it probably served as a talisman against poisoning and evil influences. Its image set against a door post protected a building from demons. Similarly, it was used in funerary art to protect the spirits of the dead. Han dynasty warriors would carry tiger amulets, usually of jade, or metal tallies with their image. Various deities are depicted riding on the backs of tigers and it was believed to be obedient to authority, retreating to the mountains when commanded to do so. The image of a boy riding a tiger refers to one of the paragons of filial piety who distracted the beast in order to protect his father. The white tiger is the guardian of the Western Quadrant of the universe and represents the autumn. The tiger and the dragon together are the principal animals of Taoist Feng Shui. According to Taoist thinking the dragon has the nature of wood, which produces fire, while the tiger has the nature of gold, which comes from the water. Their combined names are given to the sacred Taoist mountain, Longhushan, where the founder of the faith practiced alchemy, creating an elixir which caused a dragon and a tiger to appear out of thin air. The “red tiger” was a feared demon and in Tantric images Buddhist deities sometimes wear a tiger’s, skin in their warrior-like poses, the idea derived from Shivaism. Early Chinese paintings show tigers being quelled by Buddhist sages. In Zen Buddhism tigers and dragons symbolized nature and the human spirit which could be mastered by the powers of Buddhist insight. The Ashikaga Sha´guns, who were in power from 1338 to 1573, owned ink paintings of tigers by various southern Sung masters which drew much admiration. To the military classes the tiger was emblematic of strength and virility. The huge cultural influence which China had on Japan led to them adopting the joint images of tigers and dragons as symbols of power. The official Kano school of painting produced countless works of these subjects which were to adorn the homes of the military classes, carrying with them the message of authority and the stability of the social status quo. A very common symbolic combination in art is the tiger in a bamboo grove, often depicted in Kano school screens and paintings. There are many explanations of this combination. Some say the bamboo never resists the wind, and the wind is a constant companion of the tiger, and therefore this grass is a natural harbor for the tiger. Another explanation is that the wind tossed bamboo symbolically represents a wild and tangled tossing pit of sin and that in order to penetrate this sinful jungle one needs the strength of a tiger. To have “tiger courage” was the goal of all youths, particularly the Samurai. Many possessed tiger charms and amulets to give them strength, to ward off bad luck, and to discourage demons. In general the tiger’s symbolic meaning is “fluid rather than fixed.” It is credited with supernatural powers and is reputed to live to the age of 1,000 years. After it reaches 500 years of age it is said to turn white. It becomes immortal at 1,000 years and can take any shape or form it desires. 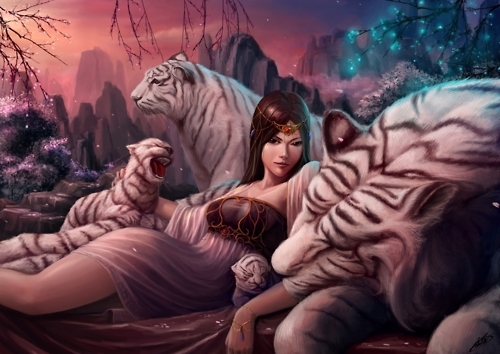 There is a folk tale which lauds the wisdom of the tiger. It tells of a mother tiger with three cubs who wishes to cross a river. However, one of her cubs is fierce and vicious, and she is fearful of leaving it alone with any of its brothers since it might do them harm. Coming to the edge of the river, she takes the troublesome cub in her mouth and swims to the other side, where she deposits him. She then returns for the second cub. Carrying him to the other side, she then picks up the fierce cub and goes back across the river carrying him with her. She places him on the beach and takes the third cub across to the other side and puts him with his gentle brother. Finally she returns for the troublesome cub and once again carries him across to where his two brothers wait. The tiger is often seen by the side of a waterfall, since the characteristics of both are their ceaseless strength and their forcefulness. The tiger is a symbol of strength, fearlessness, and the power of faith. Referring to a safe return from a perilous journey, a popular saying is “a tiger travels a thousand miles and returns home again”. Since ancient times the serpent has been an object of awe, inspiring worship in many religious sects and imbued with great supernatural powers. 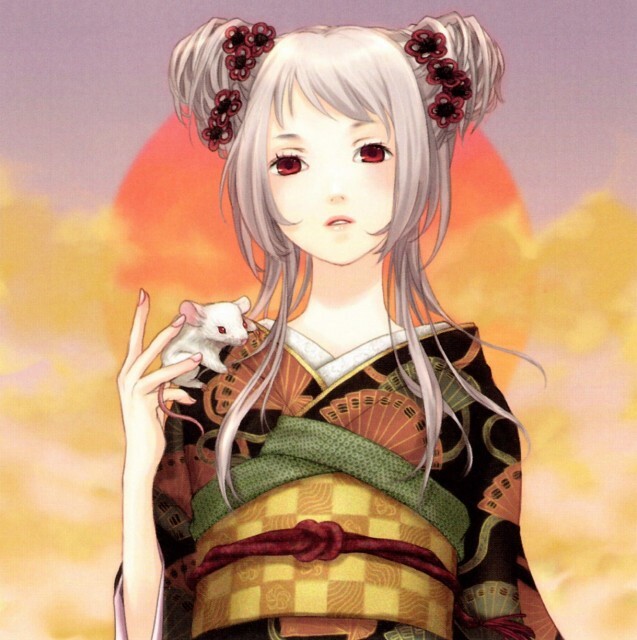 For example white snakes were said to be reincarnations of Shinto gods. In the Kojiki it is related that Susano-o, brother of the sun goddess, slew an eight-headed serpent from whose tail he withdrew the sword which came to be one of the Three Sacred Treasures composing the imperial regalia. When Buddhism reached Japan from China in the sixth century, the Shinto religion already worshiped a snake deity called Orochi which became merged with the Buddhist guardian deity Ryo, a dragon-like serpent who controlled the clouds, rain and water. The images of the snake and the dragon are much intertwined. One story tells of the 17’th century poet Kyo´rai being begged to accompany a strange looking old man to a certain seashore. On their arrival, however, the traveler revealed himself as a giant white snake, over a thousand years old, who with the poet’s help had managed to achieve the final stage of his ascetic tasks and was forthwith transformed into a dragon. In many of the world’s cultures the snake inspires loathing and fear, probably due to its silent presence and ability to shed its skin. The shedding of skin must also have contributed to its reputation of being able to transform into human shape, such tales abounding in Japanese folklore. A person might also choose to come back into the world in the form of a serpent in order to exact revenge and impose justice, in which case his image is heroic rather than evil. The subject of a snake entwined around a skull appears quite frequently in art and may refer to this belief in souls reappearing as serpents. A snake in an old house should be left in peace as it is considered to be a guardian spirit. White snakes are considered auspicious as messengers of the gods. 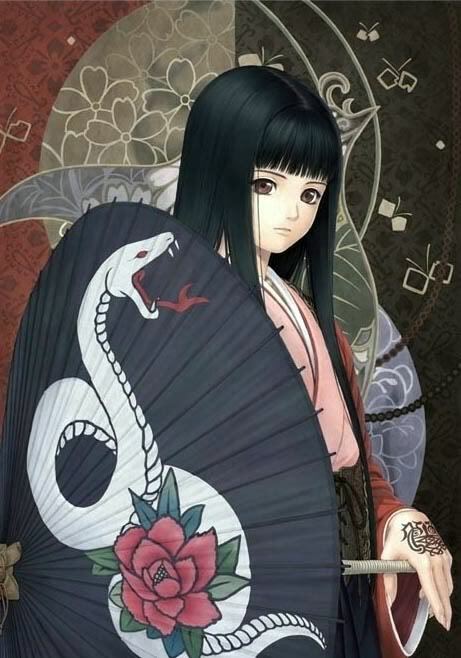 The truest form of the snake was the attendant and messenger of the goddess Benten. According to ancient legend, on the island of Enoshima there lived a serpent who was rapidly depopulating the countryside, until one day, following an earthquake, there arose an island in the middle of a lake. Upon this island was hidden the serpent’s lair. The goddess Benten descended upon the island and married the serpent, thus causing it to cease its wanton activities. In art she is frequently portrayed accompanied by a snake. In general, the snake has become emblematic of deceit, cunning, and most particularly jealousy. Superstitions hold that human saliva is poisonous to snakes, as described in the tale of “Tawara Toda,” and also that iron offers particularly good protection against snake bite. There are still stores in China and even Japan today that sell snakes and snake extracts and medicines made from snakes, which are said to possess remarkable curative powers. People born in the year of the snake are quiet, wise, and wealthy. Relying on their own judgement, they are determined and persist until their goals are attained. They are deep thinkers and financially lucky. Men born in the year of the snake are passionate and handsome, and women are beautiful. The dragon is by far the most popular mythological creature represented in Japanese graphic and glyptic art. The reason is undoubtedly twofold: the first being its great mythological and symbolic significance and the second being its almost ideal artistic adaptability, both in expression and in form. An early Chinese writer describes the creature’s appearance thus: “Its head like a camel, its horns like a deer, its eyes like a hare, its ears like a bull, its neck like a snake, its belly like an iguanodon, its scales like a carp, its claws like an eagle and its paws like a tiger” – a mighty assemblage of creatures indeed. Thus its fierce face and undulating scaly body provided the Japanese artist an ideal subject in which to give full imaginative vent to power of expression and swirls of motion. Furthermore, in the graphic arts, such as painting and lacquer, dragons were often portrayed along with eddies of water and swirls of dense, ominous clouds – a perfect combination for decorative effects. Like so much mythological iconography, the dragon image reached Japan from China, which in turn had adopted it from Indian culture. Northern Indian Buddhism had adopted elements of Naga (snake) worship, which when it reached China was in turn assimilated into local beliefs regarding dragons. In China it embodies male power and fertility (yang). From the time of the Han dynasty (206 BC ~ 220 AD) it became the symbol of the emperor. The imperial dragon of China is identifiable by its five-clawed feet, while courtiers were permitted only to use the images of four and three-clawed dragons. It is the three-toed version which appears in Japanese art. Pictorially the Japanese dragon resembles the Chinese dragon. From the description of the dragon it can be seen that its fierce face and scales and spines are also ideally suited for the powerful chisel strokes of the sculptural metal artist, and it was the favorite subject of the famous Goto school of sword furnishing artists. In general dragons are powerful, fierce, omnipotent, and representative of celestial power. While physically partially embodying the serpent, they basically differ from this creature, since the dragon in general is representative of benevolence and in art, although depicted as powerful and fierce, is not loathsome or repulsive. One of the Four Heavenly Creatures, the dragon is chief of all scaly animals and presides over authority. (The phoenix is chief of feathery animals and presides over virtue. The Kirin is chief of all hairy animals and presides over literature, while the tortoise is chief of all shelled creatures and presides over divination.) The dragon ascends into the heavens in the spring and descends into rivers in autumn, being known respectively in Japanese art as the ascending and the descending dragon. In China, four types of dragon were believed to exist: the Heaven Dragon (tien-long) who guards the gods; the Spirit Dragon (shen-long) who produces wind and rain; the Earth Dragon (di-long) who marks the courses of streams and rivers; and the Treasure Dragon (fucan-long) who watches over the wealth hidden from mankind. Each was believed to reign over one of the four seas encompassing the earth. It was the Spirit dragon which caused rain and storms and which found its way to Japanese iconography. Powerful ink paintings depict them amidst swirling clouds. In Japanese art the dragon is traditionally never displayed in its entirety, for to see the entire dragon is to invite instant death, the punishment for looking upon too much divinity. Thus in art its undulating form is represented weaving in and out of clouds or water. The dragon is also commonly depicted in art, more commonly in metal art, entwined about a sword. This alludes to the story of the god Susano-o, who, after destroying the eight-headed serpent, found a beautiful sword within its tail. Dragons are also identified by their colors, which range from red, violet, and blue to green, yellow, white, and black. The rain dragon is known as Amary, and is said to be black. Fukury, is the dragon of good luck and is represented climbing to the top of Mount Fuji – a symbol of success in life. The yellow dragon is identified with the imperial household. The white dragon’s breath is believed to become gold. The saliva of the violet dragon turns to crystal balls. The dragon fears iron and is also capable of being slain, as noted in legendary tales. It is also a lustful creature, and the fabulous animal known as Kirin is said to be the offspring of the dragon and the cow. Dragons are associated mythologically with various gods and sages. A dragon emerges from the sea at the command of Kannon and is the steed of the goddess Benten. The dragon of Japanese mythology was adapted and modified from Chinese concepts which in turn reflected Indian and Taoist influences. It originally embodied the principles of the male and the female, the Yang and the Yin, and was associated with the powers of water, both of rain and of the sea, each of which was of equal importance respectively to the Japanese farmer and fisherman. With the advent of Taoism the dragon became endowed with magical powers, being able to transform itself into innumerable things. Under the influence of Buddhism it finally became endowed with spiritual and philosophical qualities and became the protector of divinities and a symbol of the transience of life and the perpetual state of change and evolution. Under the influence of Shintoism it related to the omnipotence of the imperial household. Specifically the dragon may assume any dimension. It can fill the universe with its body or become so small as to be invisible. Thus the dragon’s many-sidedness embodies the idea of the male and the female principle and the utmost attainment of the embodiment of wisdom. The continuous changes and variations of life are symbolized by its unlimited powers of adaptation, accommodating itself to all surroundings and therefore having no end, like the everlasting cycles of life. The dragon’s breath is changed into clouds from which rain pours down and lightning flashes forth. It is also believed to carry water from the earth to the skies, and therefore in periods of drought it is worshiped in various ways. There are numerous popular legends associated with the Dragon King (Ryu-jin), who is reputed to live in a palace at the bottom of the sea. His chief messenger is depicted as a white serpent carrying the sacred jewel (Tama), which controls the ebb and flow of the tides and represents omnipotence. This jewel, which was once stolen from the Dragon King, is often illustrated in Japanese art as having just been caught in the claws of a dragon. The Dragon King is represented as a bearded old man with a dragon on his back, the dragon’s head forming his head covering. When aroused, the Dragon King is responsible for the storms of the sea. Finally the dragon is associated symbolically in art most frequently with the tiger and the phoenix. The tiger, while usually a yang force, in this association represents the material or yin forces and is bested by the dragon, which represents the spiritual or celestial or yang. The breath of the tiger creates the wind, and together with the clouds of the dragon, rain is created. The dragon-phoenix combination again represents the yin-yang principle, the dragon representing the positive yang and the phoenix the negative yin. 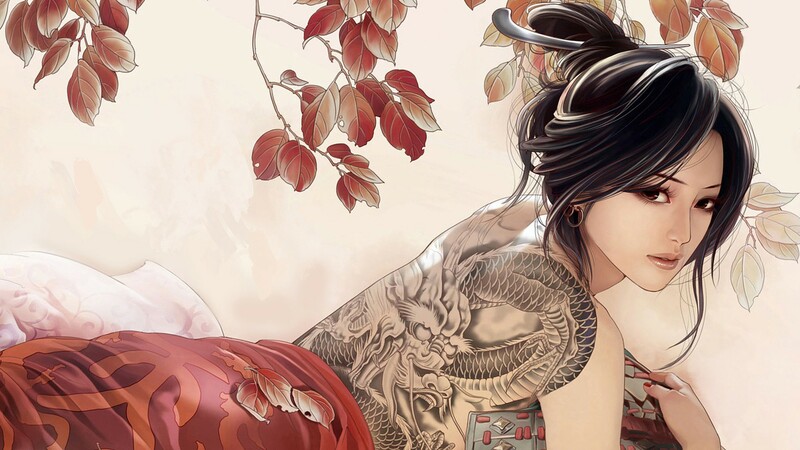 People born in the year of the dragon are healthy, honest, and brave. Dragon-year people are considered fortunate because their sign represents the heavens, or celestial powers. They are energetic and sensitive and inspire trust. Their word is good, their opinions sincere and just.